SCOPE Organizer, Tracey Beltran, speaking at a STAND LA Toxic Tour in South LA. Throughout its history, the fossil fuel industry has played a major role in the development of the City of Los Angeles. The massive oil fields and high production rates have branded L.A. as the largest urban oil field in the country. While the development of these fields didn’t pose a problem to the city’s 50,000 residents in the 1890’s━in 2017, more than 580,000 residents live within a quarter mile of a drilling site. Due to over-development and a history of poor, often racialized, land use decisions, many drilling sites are located in communities with a higher percentage of residents of color, and high rates of poverty, unemployment, and linguistic isolation. South Los Angeles is one of these communities. While residents may be unaware that they live above oil reserves deep underground, the direct health impacts on surrounding residents is clear. Local residents report high rates of heart disease and respiratory illness, such as asthma, conditions that are exacerbated by air pollutants produced by oil drilling and extraction. 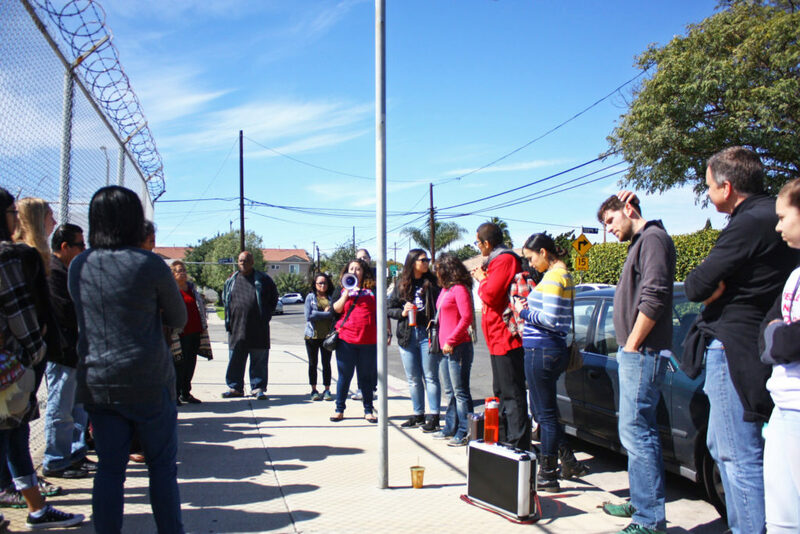 SCOPE Organizer, Tracey Beltran meets with residents that live near active drilling sites and talks with them about the negative health impacts they and their families are seeing. Beltran has also been working with them to develop their leadership skills and to better understand and speak about the impacts of urban oil drilling in their community. SCOPE Staff and Members at City Hall supporting STAND LA. 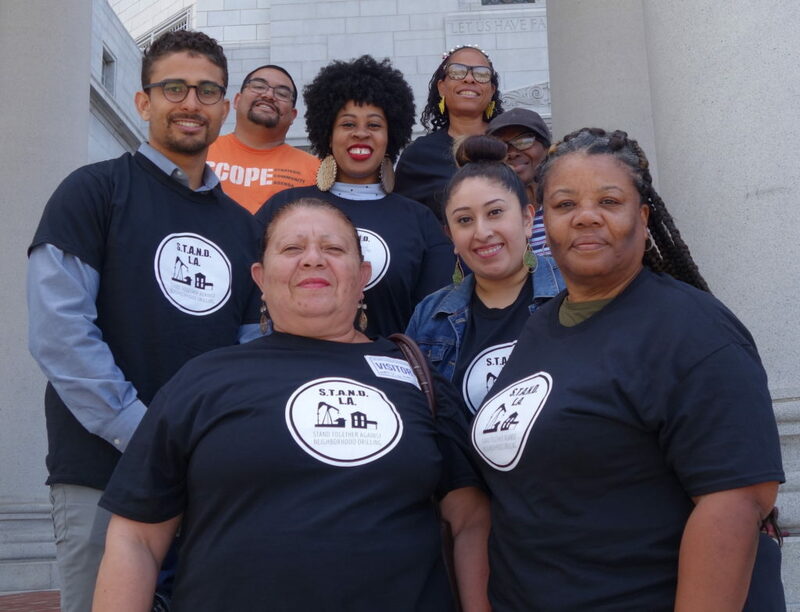 SCOPE is known as an organization that advances strategic campaigns to build community power, economic opportunity, and resilience in low-income communities of color. 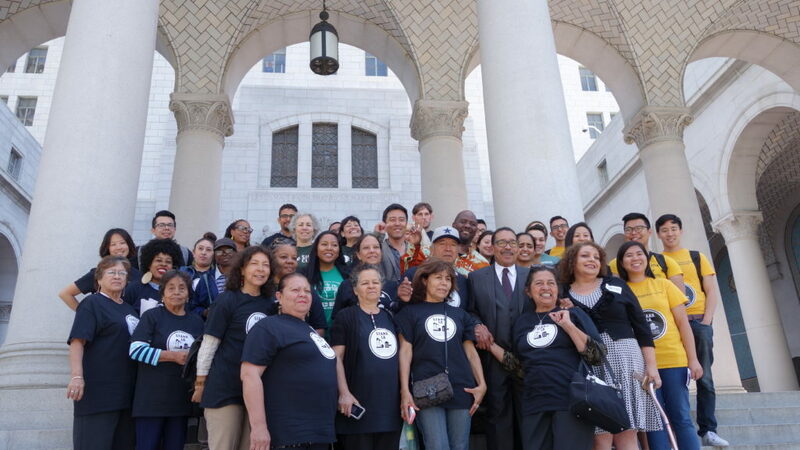 In recent years, we have been fighting to curb pollution in communities like South L.A. and move towards a more sustainable and just economy with partner organizations like the California Environmental Justice Alliance and the California Climate Equity Coalition. In South L.A., residents understand first hand the need for environmental regulation that protects our health coupled with the adequate resources to address years of pollution and disinvestment in our local communities. This is why we joined the Stand Together Against Neighborhood Drilling (STAND L.A.) Coalition in the fight to curb oil drilling in residential areas. STAND L.A. is comprised of community and environmental justice groups striving to put an end to neighborhood oil drilling in Los Angeles and to protect the communities that are most impacted by it. While stopping the practice of neighborhood oil drilling in a city whose development went hand in hand with the expansion of the fossil fuel and auto industries is no easy feat, the Coalition’s campaign is gaining momentum. On April 19th, City Council President Herb Wesson introduced a motion to study the feasibility of shutting down all active oil and gas wells located within 2,500 feet from homes, schools, hospitals, parks, and other public areas. Oil companies are already pushing back against this study, claiming that an ordinance to shut down oil and gas wells will hurt the local economy, even when little to no evidence exists that these sites benefit local residents or workers. STAND LA Coalition with Councilman Herb Wesson at City Hall. Beltran says, “In my conversations with residents who have dealt with these corporations first hand, I’ve gained more insight into their practices and true intentions to maximize profits over the health of families. Some residents have shared with me that they receive a few hundred dollars a year in royalties from oil companies, but that doesn’t begin to cover the irreputable health damages caused by living next to an active drilling site.” It’s both SCOPE’s and the Coalition’s long term goal to move the City of Los Angeles away from reliance on fossil fuels, such as oil and gas, towards clean and renewable energy sources. But equitable energy policies and targeted investment is needed to ensure South L.A. residents and workers are not left bearing unfair environmental or economic burdens. This is what we call a just transition away from a fossil fuel economy to a more sustainable and just economy that supports healthy and thriving communities. The motion has been reviewed by the Health, Mental Health, and Education committee and recommended to LA City Council along with an amendment for a Health Impact Assessment and economic impact report to be included in the motion study. The full city council will vote to move on the study on June 30, 2017. “SCOPE will continue fighting for working class families of color in these trying times. From the city to the state level, we will be fighting for communities like South L.A., because we all deserve a healthy, thriving, and more resilient future,” says Beltran.